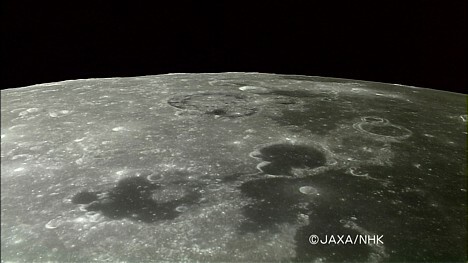 The Japan Aerospace Exploration Agency (JAXA) and public broadcaster NHK have succeeded in capturing the world's first high-definition video of the moon taken from lunar orbit. 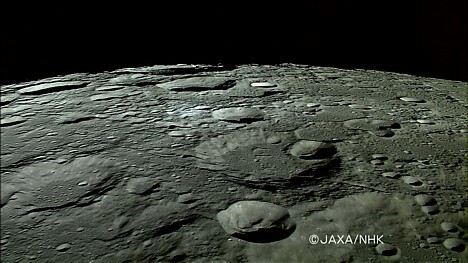 The 8x time-lapse video was shot using an HDTV camera aboard the KAGUYA lunar explorer, a.k.a. SELENE (SELenological and ENgineering Explorer), while in orbit 100 kilometers (62 miles) above the lunar surface. 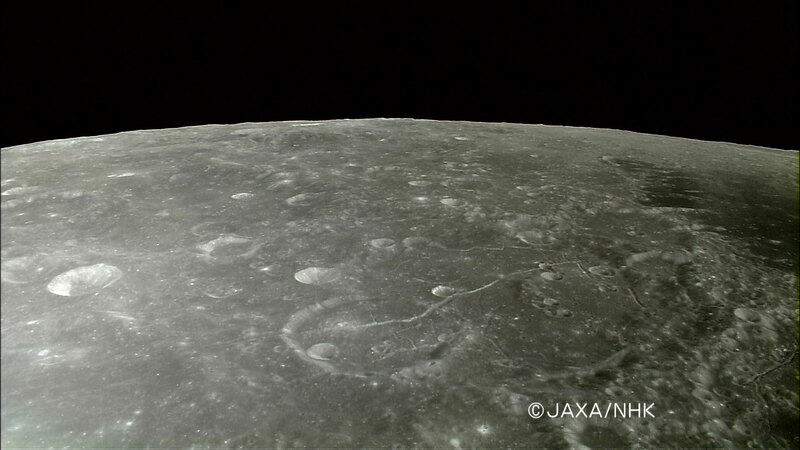 JAXA has posted an online version of the video, which is divided into two parts. The first part was shot on west side of the Ocean of Storms as the explorer moved from south to north, and the second part was shot from a location north of the Ocean of Storms (Oceanus Procellarum) as the explorer moved toward the north pole. The footage was taken on October 31. This still was taken from the first part of the video, which was shot on the west side of the Ocean of Storms as KAGUYA moved from south to north. The dark area on the right side of the screen is the "ocean," and the bright area on the left is called the "highland." This still, which also shows the west side of the Ocean of Storms, was taken from the end of the first part of the video. The Repsold crater, which measures 107 kilometers (66 miles) across, is visible in the center of the image, near the bottom. This still, taken from the second part of video, shows an area north of the Ocean of Storms, near the north pole. At this high latitude, the low-angle sunlight casts long shadows in the craters. The online video does not include the much-anticipated shot of the earth rising over the lunar horizon, but perhaps NHK is saving it for when they broadcast the footage in its full, high-definition glory. That is amazing video. The picture is so clear that it looks like the probe is only a few hundred feet off the surface. EDO thanks for this pictures mate. I love Moon! I am wondering could we see foot print on the surface using that HD cam? Have they found the lunar lander yet? Well, it's supposed to be HD, so where is the full resolution video ? This would be cool if it was actually HD resolution. But it's not. That window doesn't even look like it's DVD resolution. Que legal essas imagens da lua! Muito nit�das mesmo! Parab�ns ao bom trabalho deste excelente blog! Abra�os do Brasil! Well, it�s supposed to be HD, so where is the full resolution video ? That's the way the moon was meant to be seen...in HD. I'm sure we'll be able to see every planet/moon in HD in the near future. What a joke...still afraid of what we might see on the surface? We are starting to see the tip of the iceburg, thanks to those people who care about all of us knowing the truth.......our true origins....all of these powerful telecopes and satillites and rovers...are giving the public nothing out of tens of thousands of pics and videos in hd,but minipulated pics and a lot lower resolution......we are in no way stupid to your propaganda that you give us...all of us can handle.the the real story..seems like you can't. Time to step it up folks!